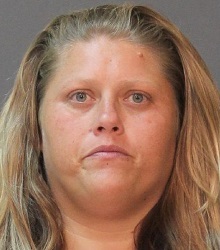 On August 5 at approximately 4:00 p.m., Calcasieu Parish Sheriff’s Office deputies responded to a report of a 7 year old child and an 18 month old baby left unattended inside a car in a parking lot of a local casino in Westlake. Upon arrival deputies spoke with casino security personnel who stated they observed the children inside the car with the air conditioner running. Casino security located the children’s mother, Brooke R. Evetts, 38, Trinity, Texas, inside the casino and escorted her to the car. When detectives viewed surveillance footage at the casino they learned the children were left alone in the car for approximately 40 minutes. Evetts was arrested and booked into the Calcasieu Correctional Center and charged with 2 counts of child desertion. Her bond is still pending. The children were released to a family member. CPSO Deputy Sr. Cpl. Brian Batchelor is the arresting deputy and Detective Ben Hare is the lead investigator on this case.